The Hawks finally put together a full, efficient team effort in their defeat of city and conference rival Temple. By pounding the ball inside rather than relying on three-pointers, Saint Joseph’s was able to display a cohesive half-court offense. SJU improved to 13-7 overall and 4-3 in conference. Ron Roberts led Saint Joseph’s with 18 points and 12 rebounds and Halil Kanacevic continued his own personal hot streak with 12 points and 9 rebounds. The two forwards combined with CJ Aiken and his 16 points to give the Hawks a dominant presence in the paint. 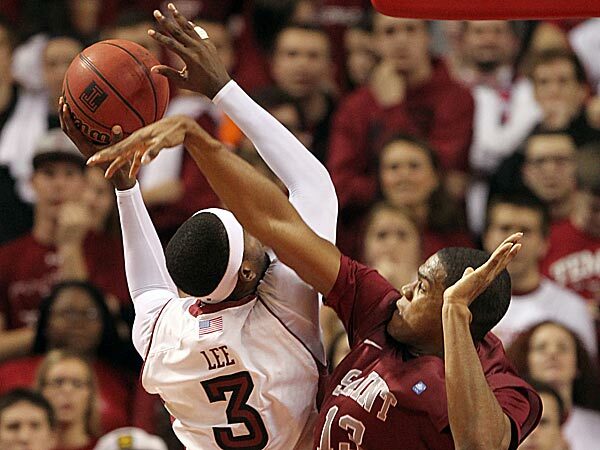 Only 21% of St. Joe’s attempts against Temple were three-pointers, compared with 41% on the season, and it paid off. Saint Joseph’s scored 40 points in the paint compared to only 16 by Temple. The game was remarkably well-disciplined as there were only 16 total turnovers including only 5 by Temple. The Hawks only recorded 9 fouls on the night. The Hawks eliminated a 9-point deficit late in the second half to go up by 4 on the Owls who were led by an outstanding performance by Khalif Wyatt who ended up with 34 points. Wyatt made a long three to cut the deficit to one point with under 10 seconds to go and Tay Jones missed the front end of a one-and-one but Temple was unable to score with 7 seconds remaining. Team captain Langston Galloway continued his puzzling regression with 8 points and no three-pointers. The only major contributor from the Hawk backcourt with Jones who scored 16 points to go along with 4 assists and 5 rebounds. Saint Joseph’s now travels to Dayton for a Wednesday night tilt. So excited to see my boys Xavier rock it at the A10 Championships next month at the Barclay’s Center! Hope everyone’s got thier tix!